It is a warm morning and I am out early to try and beat the heat. It is also obvious that the birds are more active this time of the day in this riparian area on Outlet Creek. There are lots of bird sounds especially the young birds calling to their parents. Everywhere there are birds flying, enjoying the coolness of this early morning and searching for food. The first birds I hear and see is a large family of Black-headed Grosbeaks, Pheneticus melanocephalus, which is one of our common neotropical migrants from Central America. I did not get a photo of these birds but it is very easy to identify the adult bird with a large conical beak, black head, and orange-ish body with white spots on the wings. Its’ spring song is one of the most beautiful common songs in the mornings here, very melodic and robin like. But this time of the year what we hear are the whining sounds of the young birds, which do not look like the adults except the bills. Most of the time juvenile birds do not appear physically the same as adult birds. The young Black-headed Grosbeak have soft yellow and white striped heads. They seem to be chasing their parents begging for food. There are also a few young Western Tanagers, Piranga ludoviciana, flying about the same trees searching for seeds and insects. This is another neotropical migrant that comes to the Willits valley to nest. The juveniles of these birds are also not the same as the adults, they have softer colors and no red on them. This creek is a perfect place for bathing and the next birds I see are taking baths. 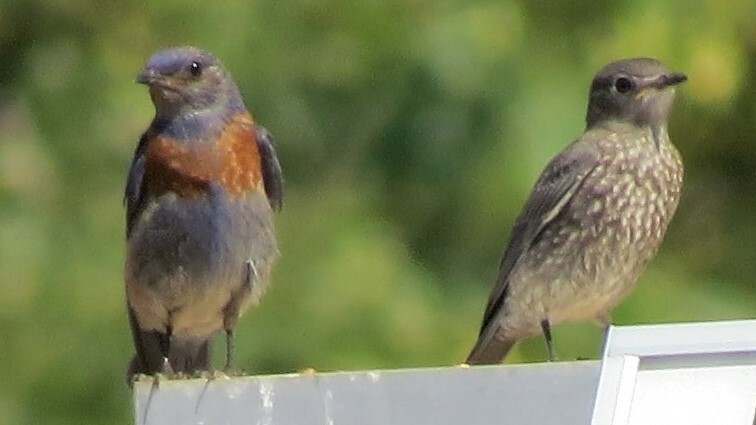 The Western Bluebird, Sialia mexicana, is in a family group and the differences between adults and juvenile birds are very obvious. The photo shows the spotting on the young compared to the adult with its orange band and blue head. The young bird keeps crying to the adult so it continues to catch bugs in the air and hand them to the baby. 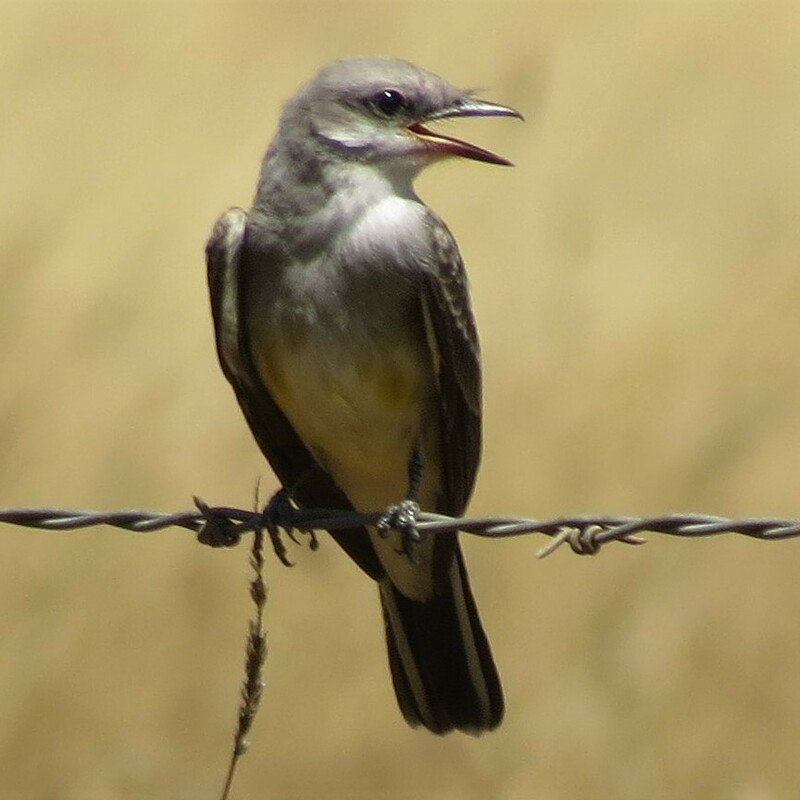 A little farther on I hear the sound of the Western Kingbird, Tyrannus verticalis, a Mexican migrant that is a flycatcher. This loud and territorial bird nests in many unusual places like on telephone poles, building ledges, or in this case, in the valley oaks out in the grasslands. There are a variety of interesting sounds that they make while they are defending their area against Common Ravens, Starlings, even Red-shouldered hawks, but what I am hearing is this young bird, which I caught a few photos of, crying to its’ parents so they will feed it. The grasshoppers that are abundant in these fields must be a wonderful source of protein for them and many other species of young birds. 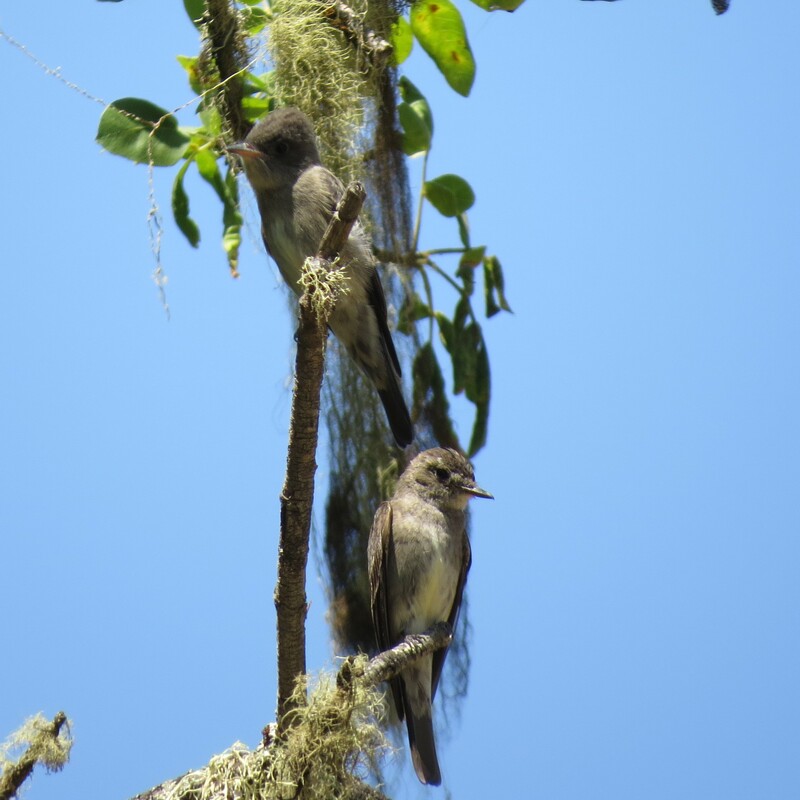 There is another flycatcher that is common along the riparian corridor and the oak woodland areas that makes a soft, burry, descending whistle especially at dawn and dusk but can be heard any time of the day. That bird is the Western Wood-Peewee, Contopus sordidulu a small, plain, gray- vested bird that feeds almost entirely on insects. The Wood Peewee is a long distance migrant to our area and comes from northern and western South America in late May. There is an adult and a juvenile bird right in front of me in the lichens of an ash tree. 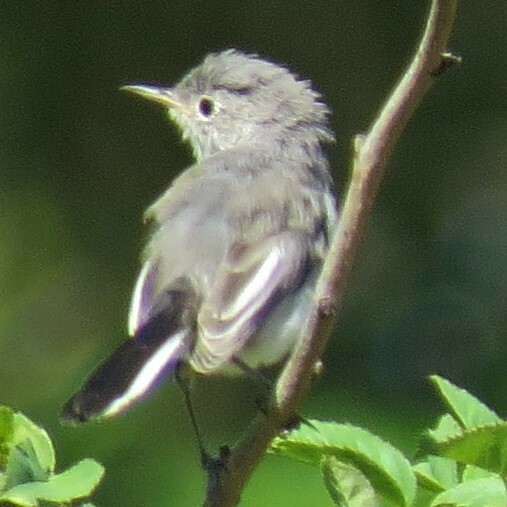 The small dark crest on the adult is noticeable. 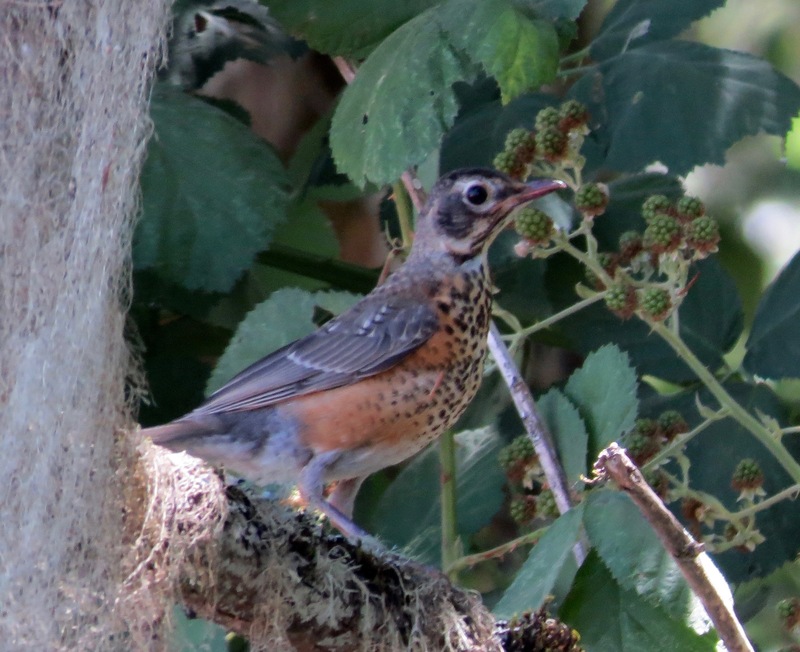 The other common juvenile bird I keep hearing and seeing is the Amerian Robin, Turdus migratorius. This juvenile I have photographed is very spotted with a little yellow-orange on its’ breast. Robins are in the thrush family and therefore have an amazing array of sounds they can make, some beautiful, others are just high and low notes. A series of notes let the parents of this juvenile know that it is hungry and wants food now. I am impressed with all the energy it takes for all of these parents to feed their hungry young! It is heating up as I walk out in the grassland by the northern wetlands at Watson. I have only a little time left before I need to get out of the intense summer sun but I hear an unusual nasal high pitched series of notes and move towards it. 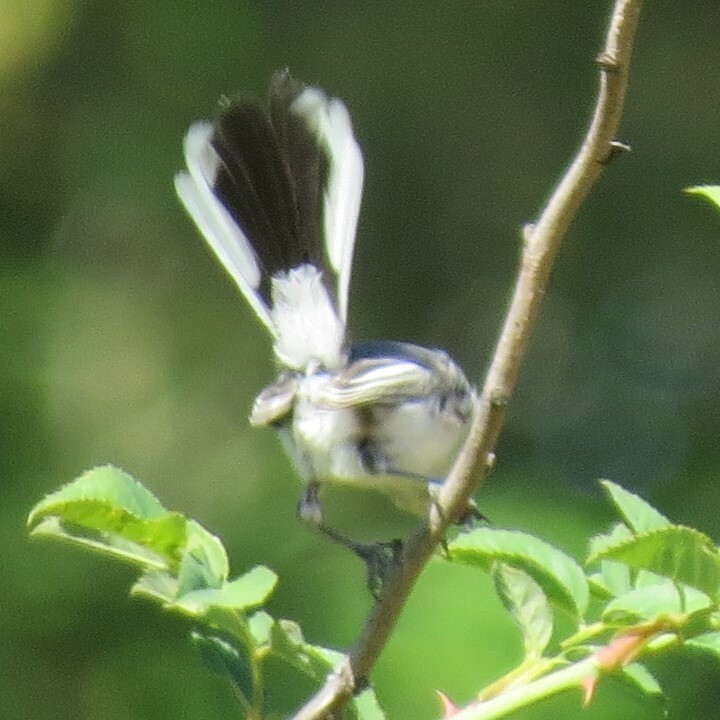 It is a sound I recognize as a Blue-gray Gnatcatcher, Polioptila caerulea, a new bird for this area. Trying not to scare it away, I move closer and make a few “pishing” sounds to get it to come out of the rose bush it is hopping around in. Suddenly it flies directly at my face so I have to duck! It lands back in the rose bush where I am able to take some photos of it. The photos show me that this is a juvenile bird, it is scruffy and looks to have a remnant “gape” or yellow area at the base of the beak. It is fun to watch its antics as it looks for food, sometimes hovering over the leaves as it looks for insects to eat. Quickly it is gone and I am content to have seen this migrating bird on its way south through our valley. What an amazing world we are surrounded with right now full of active and hungry young birds that are being fed by their tireless parents or finally figuring it out for themselves and able to find their own food.